One way to engage the public that also allows citizens to learn more about issues and provide input is to encourage attendance at public meetings. Public meetings are, at their best, a way to engage with citizens about their government. 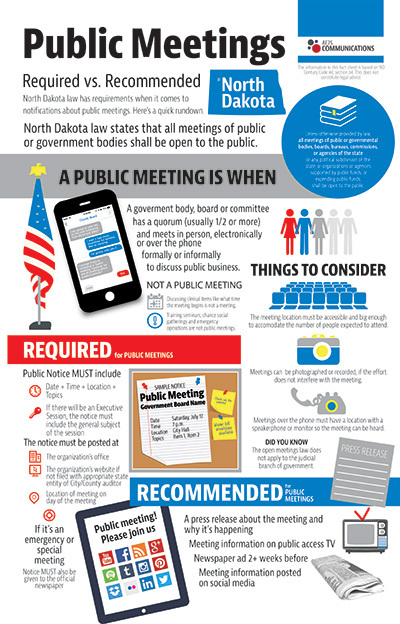 At their worst, public meetings are feared by officials and planned to avoid engagement.The North Dakota Century Code allows very few exemptions for closed meetings or meetings that are not properly notified. There is a great resource on the Attorney General’s website outlining the notice requirements for open meetings and if you have more questions about that you should contact your legal counsel.Simply put, if a majority (or less in some instances) of the people on a government board discusses public business in person or electronically, it’s a public meeting and the public must be properly notified. 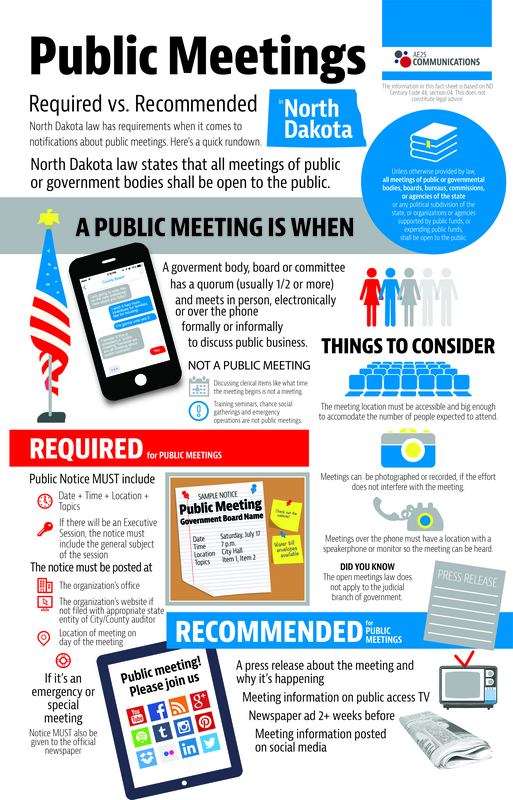 While North Dakota law outlines the bare minimum required for giving notice to the public about a meeting, AE2S Communications recommends a more proactive approach. First, take the time to get the information out on the website, newspaper ads, and posters in gathering places early. Two weeks is a good time frame to start with. This helps people add it to their calendar and understand the topics you will discuss. Secondly, send a short press release or call a member of the local newspaper or television station about the meeting and agenda. Let them know when and where the meeting is happening, but beyond that help them understand why the topics that will be discussed are important. Finally, use the resources at your disposal regularly. If your town has a public access TV channel, ask them for a regular slide to show meeting information or results from the meeting. Post the information on Facebook, Twitter, or Instagram. Some towns have an electronic signage board. Adding public meeting information to the board is a great way to keep people informed. Take some time to evaluate how you notice public meetings in your community. Are there easy, cost-efficient things that you can add to that notice process? It doesn’t have to be amazing, but a little effort in this area can go a long way.